Imagine if Boardwalk Empire’s main characters were Sam and Dean Winchester, and you’re already on the road to understanding what Witchmarsh is. It’s an action RPG set in Massachusetts in the 1920s, as a band of supernatural hunters head out to find and retrieve the Witchmarsh Twelve, a group who mysteriously vanished. Developed by indie studio Inglenook in Leeds and published by Starbound’s very own Chucklefish, this exciting little project is after a little financial help on Kickstarter. 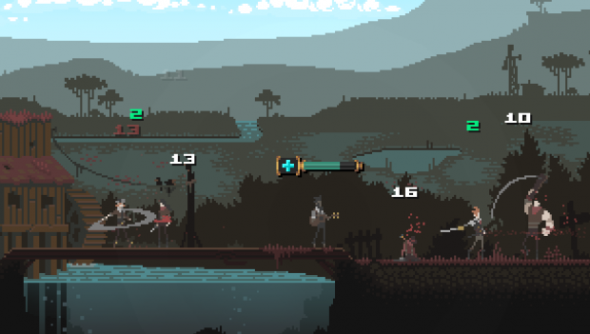 Rendered in 2D side-scrolling pixel art, Witchmarsh is quite the looker. Some moody, atmospheric shots fill the teaser trailer, and despite the 90s-like blockiness to the visuals the animations are buttery smooth. It’s all overlayed with a wonderfully jazzy period-influenced sountrack. Influenced by the likes of Baldur’s Gate and Wizardry, Witchmarsh has you gather together a team of supernatural specialists, selected from a group of ladies and gentlemen with fitting names like the Slugger, the Bard, the Illusionist, and the Trapper. All are highly customisable, and equipped with their own perks and skills. As a co-op game up to four of you can trek across Massachusetts in your hunt for the twelve, coming across speakeasies, swamps, and even a daring train-top sprint. Inglenook are looking for a very modest £50,000 to bolt Witchmarsh together. As usual there are backer rewards and stretch goals, which can all be investigated at the Kickstarter campaign page.